One of Jens Hansen’s earliest designs has been officially added to the 40th Anniversary Collection, to commemorate the July birthday anniversary of the late jeweller. The 40th Anniversary Collection was released in 2008 to mark the Nelson jeweller's 40 years of Scandinavian-inspired design. The latest addition to the Collection is a pair of classic silver cufflinks, inspired by the simple geometric form that is also evident in other designs from the same Collection, such as the sterling silver wave bracelet. 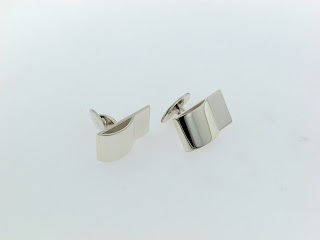 As with all the Collection’s pieces, the cufflinks will be made-to-order for customers, using Jens’ original jewellery-making techniques. The cufflinks will also come with a replica of the original workshop production card, and will bear a special edition hallmark, authenticating them as a 40th anniversary collectable. Halfdan Hansen, Jens’ son and manager of the Nelson Jens Hansen workshop, says the cufflinks are one of Jens’ earliest known designs and were popular in the 1960’s and 1970’s.